It’s men’s health week and to kick things off the Canadian Men’s Health Foundation has released a study highlighting the damaging effects of lifestyle choices on men’s health and wealth. According to the CMHF, only 30 per cent of a man’s health is tied to his genetics, while the other 70 per cent is determined by lifestyle. 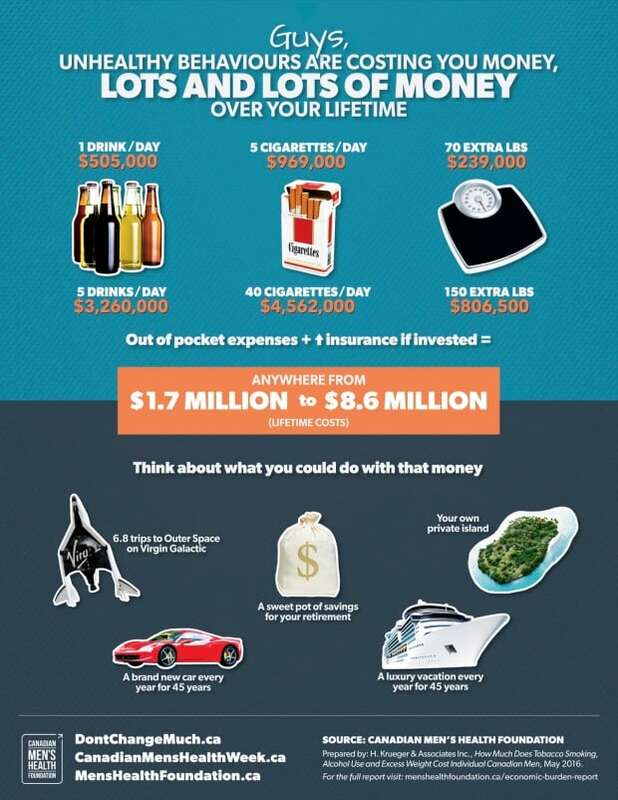 The study looked at three risk factors, including alcohol use, tobacco smoking and excess weight, and estimated the cost to the average Canadian man over his lifetime could hit $1.7 million to $8.6 million you could try this out. These costs were obtained by calculating the costs of goods, insurance premiums and investment returns based on low to high risk cases. Beyond financial loses, the report also claims that while the average life expectancy of a Canadian man is 79 years, smoking cigarettes can take 10 years off of his life, drinking alcohol, almost eight years and being obese could cut life expectancy by nearly six years. “This is eye-opening news for guys, who might not consider the true costs of their bad habits,” said the president of the Canadian Men’s Health Foundation, Wayne Hartrick, in a news release. He says the good news is that small lifestyle changes can begin to pay dividends. Hartwick says there is no magic bullet to reduce risk, but small lifestyle changes can get people on track to better health and wealth. That’s why the foundation has started the Don’t Change Much campaign, calling on men to take small steps towards improving their lifestyle. Even Prime Minister Trudeau has joined the campaign and is featured in a video encouraging others to make small changes. Hartwick says although they don’t expect dramatic changes overnight, even if a fraction of the money forecast can be saved, the financial impact would be impressive.